"A drowned corpse, a glimpsed apparition and a discordant melody carried on the breeze. The evil is back. The house has been re-opened. Just weeks after four students cross the threshold of the derelict Fischer House, one of them has committed suicide and the other three are descending into madness. To save his sister, one of the three, ex-soldier Nick Mason must join ranks with Paul Seaton -- who visited the house a decade earlier and survived. But Paul is a troubled man, haunted by visisions of an ordeal that even now threaten his own sanity. . . "
Sending off to the int'l RABCK winner for March - congratulations! One of my WishList books, I am really looking forward to reading it! Thanks for the sweeties in the lovely little bag, the bookmarks (I love the kittens), and the beautiful Hong Kong postcard! I have tagged Yorkshire-Lass with this book; I will read it soon! 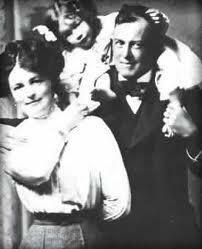 Once again, as in "Dark Echo", the writer takes us through a ghost story, but throwing in real characters in the midst; in this case, Aleister Crowley, once considered "The Wickedest Man in the World" (I've always liked this family picture of his, see pic), and the writer Dennis Wheatley, whose novels (though considered awfully written by one of the characters) now I'm eager to read! The two main characters, Nick and Paul, go on a search after the mysterious photographer Pandora Gibson-Hoare, and her strange links to the Fishcher House. There are black magic rituals, and even a human sacrifice. But throughout, characters are vivid and dialogue is sparkling. And the narrative keeps moving between present and past, aided by Pandora's diaries... but we never lose track. 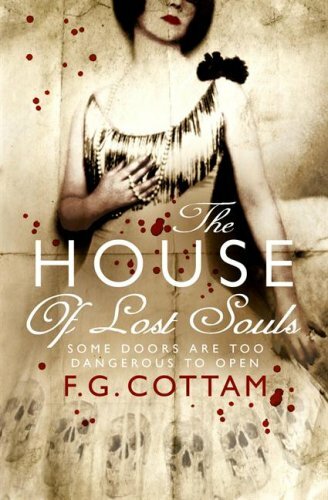 A MUST for all of us who love ghost stories; I will certainly keep on searching for more novels by this writer. Thanks for granting this Wish, Wandering-B; I have tagged Yorkshire-lass with it in the WishList Tag Game, and it will soon be on its way to her. Sent today to Yorkshire-Lass; I tagged you with this book in the WishList Tag Game. Thank you for tagging me with this, I'm looking forward to reading it, but it may be a while until I can get to it as my TBR pile is massive. Wow, this was a real page turner, once I'd started reading I didn't want to stop. I will have to lookout for more by this author. Going into Plum-crazy's Horror Book Box. Taken from Plum's horror bookbox. Wow, what a story! Like Bookworm-lady said the mix of real and fictional characters worked really well.